Bush or small tree 6-25ft (2-9m) with short crooked trunk and strong branches with very rough reddish-brown bark. Simple thin oval shiny leaves, white flower clusters. Fruit is blue-black berry looking, edible after frost (advisable to not eat uncooked). 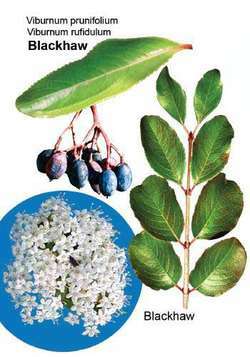 Bark, root or stems used as a sedative, for gynecological issues, menstrual cramps, (relaxes uterus), menopause. Anti-spasmodic also used for digestive cramps, bronchitis, asthma and lung problems. Used historically to prevent miscarriages and abortions. Also contains salicin (natural aspirin).